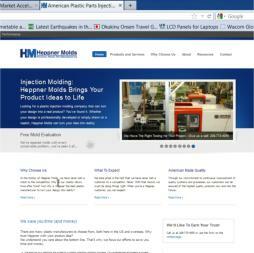 I am happy to announce that one of our clients who is a plastic injection molding company has their website up and running. Many companies in the plastic’s business tend to present themselves in a very technical way but we wanted to focus on the benefits offered by the company and not just how many presses they have. The site was constructed in WordPress which gives the client a lot of control including the ability to add and change content as they wish. If your company is in need of a new website, give us a call on 503-451-0802. We work with clients across the country in addition to the Portland area.